ROAD TOWN, Tortola, VI – In the face of the law at all levels a man is innocent until proven guilty and being behind bars for over two years for a crime that one would have maintained his innocence from the get go feels like injustice. This was the case of Jomo Jack who was implicated in a major drug bust by the Royal Virgin Island Police Force (RVIPF). On Monday October 27, 2014 for the first time after over two years Mr Jack walked out of the Magistrate’s Court free of the silver bracelets, a symbol of a man deprived of his freedom. That afternoon he spoke exclusively with Virgin Islands News Online when he described the moment. “It is a refreshing feeling like a new born child coming into the world,” he said. Jack was among five who were being jointly tried for the allegations against them and over the years while he maintained his innocence he had the feeling that those responsible for his incarceration were not working expeditiously as they should to ensure justice comes at the earliest. “I know that justice would have come but I was in fear of the prosecution prolonging the cases in as much as it eventually tried and I know that I wasn’t guilty of anything from the start,” said Jack. He said that more than anything being someone who is not a citizen of the Virgin Islands it took a lot out of him in his attempt to prove his innocence while being behind bars and away from the strongest support one can ever get: family. “I am not from here, anything I want get done I have to actually pay somebody to transporting it. It’s costly, I am speechless basically,” he said trying to express the feeling of being free to move around while he awaits the continuation of the trial. 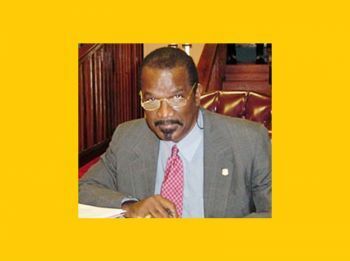 The moment he left the court his first focus was getting on the next available flight out of the Virgin Islands to head back to his home country as the ruling of Magistrate Dr Velon L. John did not relinquish those rights as a condition for bail. “I going back to see what I could get done… I want to see my mom… I want to say thanks to the father the most high my mom has always been very influential person…. There was never a moment when I got off the phone with her [and didn’t hear] the particular saying cease not from praying and that has been sticking with me for the two and half years,” he said. He said that while he will be gone from the islands he will not be running for facing the law to the end of the trial as he will be back at every date that he is to appear and further hopes to also return with the other three are to be tried as well. Actually it is not really clear when Jack and the others will be back in the court as the Office of the Director of Public Prosecutions (DPP) has issued notice of their intention to seek of the Appeal Court a stay of the trial as the also are looking to appeal a number of matters consequent of Magistrate Dr Velon L. John October 26, 2014 decision to let the men walk freely while they await the continuation of the their trial. How these islandman getting bail and our local boyz like bob them cant get bail? Son of the soil...this British Virgin Islanders would like you to SHUT TO F UP...stupid ignorant Ahole..The VI is a group of Islands. People like you make sensible VIlander look like crap...Hate people like you. I think they need to stop fighting and save their money for when they go to the mainland to hire good lawyers or just escape like the Columbians did back in the days. These were caught redhanded and got bail but bob and crew whose case was dropped cant get bail? Injustice never done! This magistrate must be a mad man, that's an assault on our judiciary, senior magistrate and governor, what are you doing about this situation, one of the biggest drug bust in the VI, is this man for real?. A "Drug Bust" is when you find drugs at the scene of the operation. No drugs were found at the scene, but drugs were found in one house, and that person pleaded guilty from the start. These men had all rights to be granted bail if you ask me. dwl....yes sah...jack muss ah smile ya now he going back SVG! U RITE. This should've never taken so long, but it seems like b/c it was a setup operation they forgot the protocols. Yes he will, otherwise they will extradite him back. SVG and BVI works together. The RVIPGang was tryin to ROB these man, ok. The magistrate realized this, and doesn't want the s..t to hit the fan. Your name says it all, hence your stupid comment. I say no more. Jamo, I bet you love that hit song by Shaggy, "It wasnt me".....LOL!